I'm going a different route for a track bike, so this is up for sale. I will first attempt to sell this whole, and if that fails then I will part out the aftermarket parts. My as-is price is $2250. Full disclosure here. I paid 1700 last year for it, but have since added a rear Ohlins shock, Ohlins steering damper, high mount Jardines and had a shop replace exhaust valves in each head, install manual tensioners, new air filter, plugs, rear wheel bearings and some carb work. Pricey work. Pilot Power 2ct's are new with 1/2 track day (I used my other bike after lunch). Rear rim is a PM Chicane with a 190 tire. Front-end is cbr1000rr ('04 I think). I have a salvage title for it. I have not gone through the salvage inspection or registered it for the street. If I don't get 2250 I will part out the good stuff. I will take PayPal. Located in Orchard Park, NY (near Buffalo). I actually had a blast on the street triple at the last trackday. I rode the VTR in the morning, triumph in the afternoon. Have you sold the bike yet? No. I plan to start removing the front-end, shock, rear wheel & exhaust for sale in the next couple weeks. I would love to have the entire bike but am having to buy another vehicle. I would however like to buy the exhaust if available. I do. 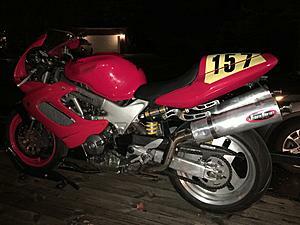 I am presently 'holding' the Ohlins shock until 11/5 for another member, but selling the whole bike would have to trump that arrangement if you're serious. I'll send you a pm with my contact info. I sent my contact info yesterday afternoon. I’d love to sell you the bike but if I don’t hear from you today at some point I’ll assume you are not ready to buy. I have some interest in the aftermarket parts and I would like to get some $$ flowing! So I guess he's not interested after all. Ohlins shock has been spoken for off of this. Looks like I'll be selling things from it here and there, so might as well say it's no longer for sale as-is. The exhaust has some cosmetic issues, but works well. I’ll pm you some pics and a price this weekend when I free some time up. OK.. I'm a little scatter brained with this bike, mainly because I don't really want to sell it. For now I think I'll keep the high mounts, but still sell the front end, ohlins shock (already spoken for) and the rear wheel.